tall, represent a place one would call home and to last for years to come. But one house located at 849 Kildare Street near St. Mary's Church, gives a new meaning to "home". 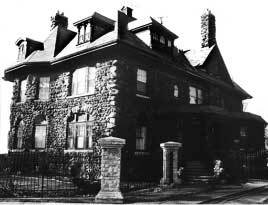 This ten-bedroom, brown cobblestone house known as "The Cobbles", is not only a home to the owners who live in it today, but served as "home" during the Second World War for Polish Army offices and the Canadian Women's Army Corps. In addition, it was a temporary Metropolitan Hospital School of Nursing in the late 1940's. The Cobbles was built in 1906 for Victor Williamson, who lived there until 1924 when it was sold to Earl C. Drake. Williamson was an independent contractor and builder in Walkerville at the time. The Walker Family controlled development of phase two planning in Walkerville, which encompassed the area to the south of Wyandotte. The Walker's did allow independent builders in the area, which may explain the unique design and fieldstone construction. One outstanding feature of The Cobbles is the roofline of turrets, stone chimneys and the variety of dormers. Its slate roof, so in keeping with a stone house, was recently replaced with asphalt shingles. Williamson became a joint partner in a real estate/insurance firm in 1911 and was president of his construction company which built King Edward School (demolished in 1994 but rebuilt retaining the original entrance facade) and many other area landmarks. The Cobbles is a lasting testament to his unique interpretation of home.